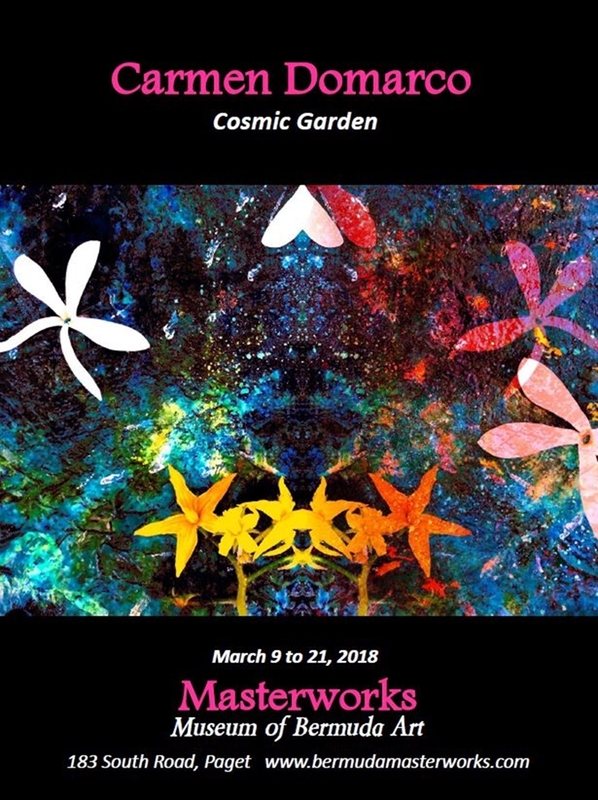 Masterworks is getting set to host an exhibition of paintings by Carmen Domarco, starting today [March 9] and running through March 21. Carmen Domarco said, “The questions we’re always asking, where did we come from, where are we going, what is our connection to the universe, why are we always looking up at the stars in wonder? “Art for me is very spiritual. In my birthplace, Seville, everything moves in relation to music, dance, passion, the scents of exotic flowers, the rhythms of flamenco. My journey as an artist began as an exploration and expression of this sense of wonder that permeates our life experience in all its forms. “In Bermuda I have been inspired by the intense colours of the ocean and flora, coral, plants and flowers. The story of Bermuda’s origins, coral growth over undersea volcanic rock, emerging above the surface as a fertile garden, supporting new forms of terrestrial life. It’s like a microcosm of this story of evolution that gives rise to our shared sense of wonder at the beauty and improbability of it all.